I am a geek, I know! I have been obsessed with all things educational & technological! So what about Piano Lessons? Yup, There’s an app for that too! 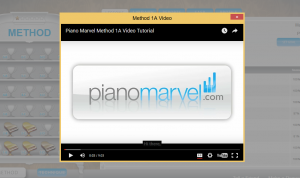 Most Lessons on Piano Marvel have a video to introduce new skills. I have been using Piano Marvel for the last couple of months to brush up on my piano skills. Lets face it, I was never that good. I took classes with a kindly lady. She made me do scales over and over and over and over and…… well, you get the idea. I wonder sometimes if she is still around, I am pretty sure she was in her 70’s back when I took lessons in the late 70’s. Yes, it’s been that long! I came across Piano Marvel while searching some way to support lessons for my 8 year old, as well as spruce up my own skills. With music being left out more and more at school I wanted to encourage her to continue with lessons even when we can’t work them into our budget or schedule. As it turns out, I am obsessed by it! It is more than an app, it is a fully interactive software that makes piano learning fast and fun. 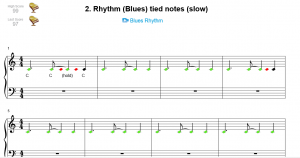 Piano Marvel allows students to learn progressively through different levels. Each level has a PDF Method Book with an over view of everything you will learn. There are also videos on the lessons explaining the new concepts introduced in the lesson. This system is so comprehensive. It is being used not only by parents, but by piano teachers as another way to get their students engaged. Each of the lessons have a backing track that plays with you so it doesn’t get so monotonous. I love the instant feedback that the computer gives you too. The design shows you where you went wrong in the piece and you can work to bring up your score. Piano Marvel shows you what notes you played wrong, early or late. You can also work on songs in the library, so you have a repertoire that you can play. There is so much sheet music included in this program that I can’t image how much it would cost if you were to go out and buy it in books. The Library works much like the lessons, the songs are broken up into smaller sections that start out slow, so the student can perfect each section before combining them at speed. 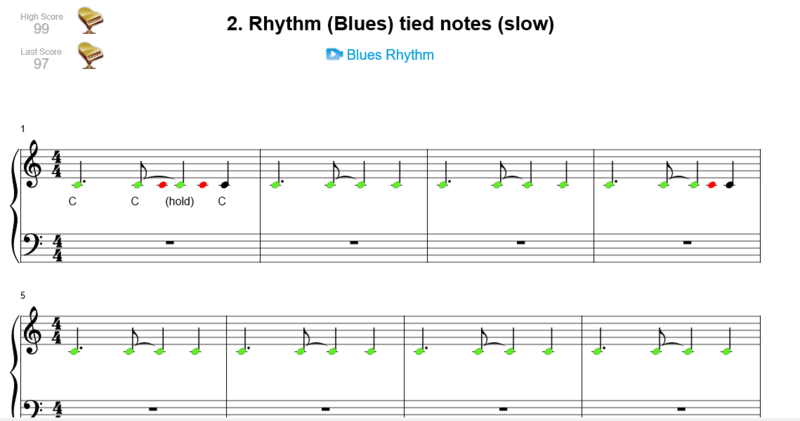 Piano Marvel lets you track your students, children or your own practice time and award levels. I love that the program allows you pull reports of how well your student is doing and how much they are practicing. These reports make it easy to reward your kids (or yourself) for doing such great work! When you are ready to can sign up for the full benefits of being a Piano Marvel Student or perhaps you are already a Piano Teacher who would like to find out how to introduce this method into your own studio you will get $3 off a month by using the Promo Code PianoCyndi at check out! You need a Midi Compatible keyboard and high speed internet. We bought the Casio Privia px160 full size keyboard and I am so amazed by it! It feels like a real piano and sounds amazing. It has sorts of other sounds that my daughter likes to use while practicing just to keep things entertaining I guess, but for me the concert piano sound is perfect! It was the perfect choice for us with small condo living (volume control). However you can find great keyboards for less just make sure that it has a midi in it. You can also start out with a mini keyboard, however keep in mind it won’t be long before you need the full size 88 key piano. Click Here for the full list of upcoming events on our Kids Calendar! This entry was posted in App Reviews, Education and "How To" Articles, Events and Reviews, Random Stuff I Like, Sponsored Offers and tagged keyboards, piano lessons, piano software by Cynthia Buckley. Bookmark the permalink.